Select an Outlook folder and click “Remove Duplicates” on the Outlook toolbar. Select Contacts folder and click the Search for Duplicates button. In Step 1, Duplicate Remover Wizard will search and remove Duplicate Contacts. In Step 2, Duplicate Remover Wizard will search and remove Junk Contacts. Duplicate Remover quickly detects contacts that are useless. After searching for similar contacts, Duplicate Remover will show you a dialog for managing the detected similar contacts. Find all few-clicks Outlook Duplicate Remover actions by clicking the Duplicate Remover icon or the drop-down menu button on the Microsoft Outlook toolbar. Remove duplicates from the selected folder in just one click. Remove duplicates in less than a minute even if there are thousands of them. Report of found, merged and deleted duplicates. 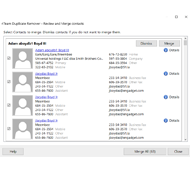 Review and Merge Outlook duplicate contacts.